Faith and Fiction Round Table: A Canticle For Leibowitz by Walter M. Miller, Jr. 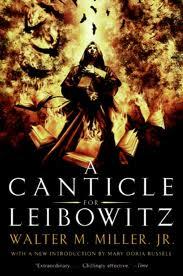 The Faith and Fiction Round Table recently read and discussed A Canticle for Liebowitz by Walter M. Miller, Jr. The book is a look, in three novellas, at a post-apocalyptic world through the ages and how it rebuilds itself. One little part that stuck out to me occurs in the first novella. Brother Francis has spent many many years making an illuminated copy of a blueprint he found in his early years. He was only allowed to work on it in his free time. He's making a trip to New Rome for the canonization of Isaac Edward Liebowitz. He's robbed along the way and the robbers mistakenly take his illuminated copy of the blueprint to be the item of value leaving him crushed, but still in possession of the original. When he recounts this story to the pope, the pope comforts him by telling him he did not waste his life on the illuminated copy only to have it stolen, but rather it served its purpose by protecting the original document. I was struck by this story for a couple of reasons, first because I do often think this is way things work. We often labor towards one end and believe in one outcome for that end, only to be surprised that life takes a different turn. There's often a purpose to things that ends up being different than what we imagined and in some cases far less glorious than we hoped for. The wink, or blink seemed to bring the room into clearer focus for the monk. For the first time, he noticed a moth-hole in the Pope's cassock. The cassock itself was almost threadbare. The carpet in the audience room was worn through in spots. Plaster had fallen from the ceiling in several places. But dignity had overshadowed poverty. Only for a moment after the wink did Brother Francis notice hints of poverty at all. The distraction was transient. (emphasis mine) I'm not exactly sure why I liked this passage except that the idea of what has value and worth is always of tremendous interest to me. There is worldly worth and then there are other kinds of worth--which is most important? One can perhaps keep you fed, maybe safe, another can enlighten your mind and nourish your soul. I feel like Canticle for Liebowitz engages this idea in a variety of ways throughout the book. The monks are often at odds with the world around them, in the preservation and use of knowledge, later in the question of the sanctity of life. It's a question that will always be there, because it's a tension that will always exist.